As we noted when we began our discussion of MEGA, the authority is the MEDC's — and the state's — flagship jobs program. MEGA has offered more than $3.3 billion in Michigan business tax credits since its inception, and it has arranged for select Michigan companies to receive many millions of dollars in state education tax credits, job-training subsidies, community development block grants, local property tax abatements and other local subsidies. Moreover, MEGA's design makes it more likely to succeed than many government economic development programs. 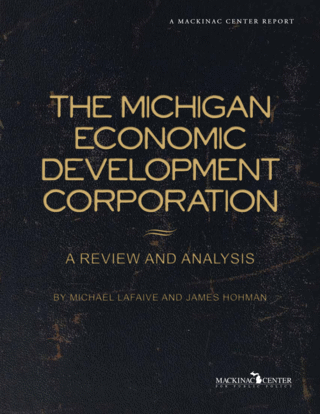 The authority's primary business incentive, Michigan business-tax credits, is not awarded until a company actually shows that it has created or retained the jobs it promised. Traditional business subsidies, in contrast, provide a promising company with benefits in the expectation of job creation (or other economic benefits). These subsidies shift wealth away from other individuals and companies, reducing their own ability to generate wealth, jobs and investment. If they are better positioned to create economic growth, this transfer may actually harm the state's economy — a real risk, since the individuals and companies subsidizing the other business are paying taxes and are generally not receiving subsidies, an indication they may be more economically viable than businesses that claim to need subsidies. Yet despite MEGA's design advantage over many subsidy programs, there is scant evidence that MEGA has worked. The authority's basic performance record is poor, and two major statistical reviews show either no jobs impact or negative jobs impact. Nor has the MEDC's corporate culture inspired confidence. Despite MEGA's purported focus on "pay for performance," it regularly announces jobs before they are created and says little about the subsequent results. It has also decreased the transparency and availability of its data, preventing the public and policymakers from determining actual job counts and evaluating the authority's effectiveness. Ultimately, the MEDC's behavior in administering the MEGA program suggests a political bent — an organization more interested in appearing effective than in achieving real effectiveness. This political element, like MEGA's ineffectiveness, does not bode well for other MEDC programs.